While seafood is often seen as a healthy food overall, certain fatty fish like salmon, tuna, and sardines are promoted specifically for their anti-inflammatory omega-3 properties. Shellfish such as shrimp, however, usually do not make that list. In addition to being high in cholesterol, seafood actually might bring on, or exacerbate, a form of arthritis called gout. Gout is the most common form of inflammatory arthritis in men, affecting approximately 3.4 million in the United States alone. New England Journal of Medicine, a 2004 study. Gout is the most common form of inflammatory arthritis in men, affecting approximately 3.4 million in the United States alone (New England Journal of Medicine, 2004). It occurs when uric acid builds up in the blood. Uric acid crystals form, resulting in joint inflammation. It may be chronic, with multiple flare-ups over time affecting one or more joints, or acute, typically affecting one joint. The attack may subside after a few days, but the chances of having another are about 50 percent. Some people may develop chronic gout, which can lead to stiffness and decreased range of motion. A 2004 study looked at the intake of meat, seafood, and dairy regarding their risk of gout. Over a 12-year study period, researchers followed 47,150 men from the Health Professionals Follow-Up Study with no history of gout and noted new cases, using a questionnaire to determine whether participants met the American College of Rheumatology survey criteria for gout. Diet was assessed every four years via a food-frequency questionnaire. During the study, 730 new cases were confirmed. Higher intakes of meat and seafood were associated with increased risk, while higher intakes of dairy were tied to a lower risk of developing gout. 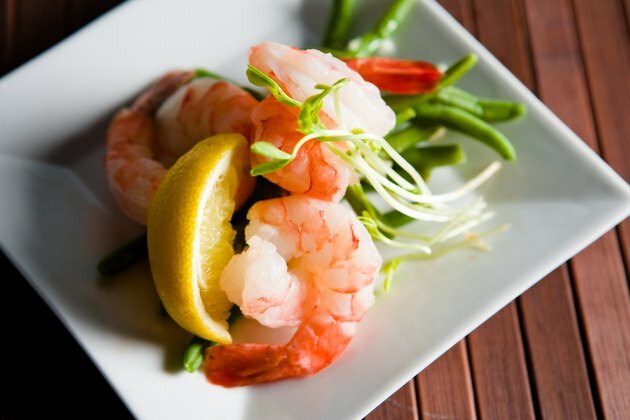 You don’t have to swear off shrimp or shellfish completely, but keeping intake moderate in the context of a balanced diet that also includes dairy may be beneficial. And keep eating your veggies. Always remember to check with your doctor before making any dietary or lifestyle changes. Jessica Cording is a health and nutrition writer and has a MS in Nutrition and Dietetics.